Engineering dynamical molecular gates represents a widely applicable strategy for designing efficient biocatalysts. Here we analyzed the dynamics of a molecular gate artificially introduced into an access tunnel of the most efficient haloalkane dehalogenase using pre-steady-state kinetics, a single-molecule fluorescence spectroscopy and molecular dynamics. Photoinduced electron-transfer – fluorescence correlation spectroscopy (PET-FCS) has enabled real-time observation of molecular gating at single molecule level with the rate constants (kon = 1822 s-1, koff = 60 s-1) corresponding well with those from the pre-steady-state kinetics (k-1 = 1100 s-1, k1 = 20 s-1). We have an open positions for the first-year Master students and the third-year Bachelor students from Poznan interested in structural bioinformatics of proteins. The call is open until all available positions are filled. See the leaflet for more details. 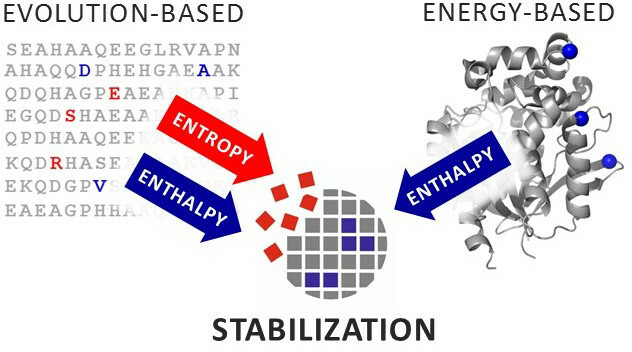 Stability is one of the most important characteristics of proteins employed as biocatalysts, biotherapeutics, and biomaterials, and the role of computational approaches in modifying protein stability is rapidly expanding. We have recently identified stabilizing mutations in haloalkane dehalogenase DhaA using phylogenetic analysis but were not able to reproduce the effects of these mutations using force-field calculations. Here we tested four different hypotheses to explain the molecular basis of stabilization using structural, biochemical, biophysical, and computational analyses. We demonstrate that stabilization of DhaA by the mutations identified using the phylogenetic analysis is driven by both entropy and enthalpy contributions, in contrast to primarily enthalpy-driven stabilization by mutations designed by the force-field calculations. Comprehensive bioinformatics analysis revealed that more than half (53%) of 1 099 evolution-based stabilizing mutations would be evaluated as destabilizing by force-field calculations. Thermodynamic integration considers both folded and unfolded states and can describe the entropic component of stabilization, yet it is not suitable for predictive purposes due to its high computational demands. Altogether, our results strongly suggest that energetic calculations should be complemented by a phylogenetic analysis in protein-stabilization endeavors. We have been invited to guest-edit the special issue on Novel Computational and Data-Driven Approaches for Protein Design and Their Application in Biomolecules journal. With CiteScore 2017 (Scopus) of 5.72, the journal ranks in Q1 in Biochemistry and Molecular Biology categories. Looking forward to the experience. Studying the transport paths of ligands, solvents, or ions in transmembrane proteins and proteins with buried binding sites is fundamental to the understanding of their biological function. A detailed analysis of the structural features influencing the transport paths is also important for engineering proteins for biomedical and biotechnological applications. 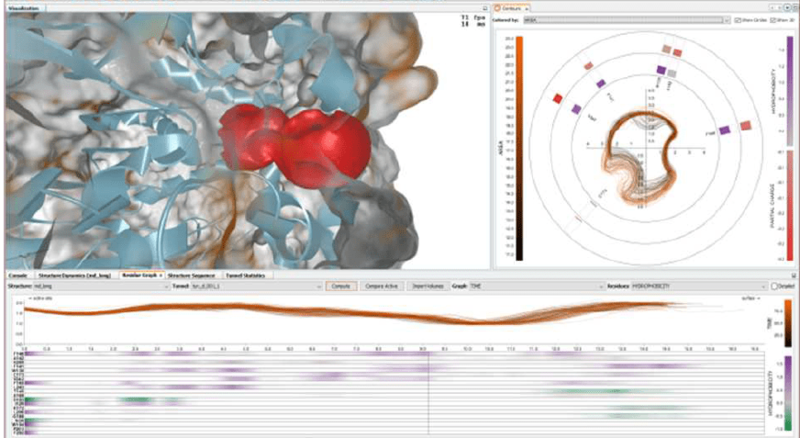 CAVER Analyst 2.0 is a software tool for quantitative analysis and real-time visualization of tunnels and channels in static and dynamic structures. This version provides the users with many new functions, including advanced techniques for intuitive visual inspection of the spatiotemporal behavior of tunnels and channels. Novel integrated algorithms allow an efficient analysis and data reduction in large protein structures and molecular dynamic simulations. CAVER Analyst 2.0 is a multi-platform standalone Java-based application. Binaries and documentation are freely available at www.caver.cz.